Our Shinkansen (bullet train) took 164 minutes to cover the 500+km from Tokyo to Kyoto as part of a longer run to Osaka and points beyond. They leave every few minutes, they never leave late, they have had no accidents since they began running in 1962 (there was uproar in about 1970 when the Prime Minister delayed one by five minutes). Seating more comfortable, more leg room, than economy air travel, in the standard Shinkansen cars. I kept thinking I should put my seat belt on. The seven day Japan Rail Pass at $A300 is a little less expensive than Tokyo-Kyoto return by Shinkansen with reserved seat. Get the pass! We left home early to be sure not to be left behind, taking the elevator in the wall across the street from our apartment down to the very deep Asakusa (Tsukuba) station, from where we went two stops on the 6.08 Tsukuba Express to Akihabara to catch the Yamanote Line to Tokyo Station. 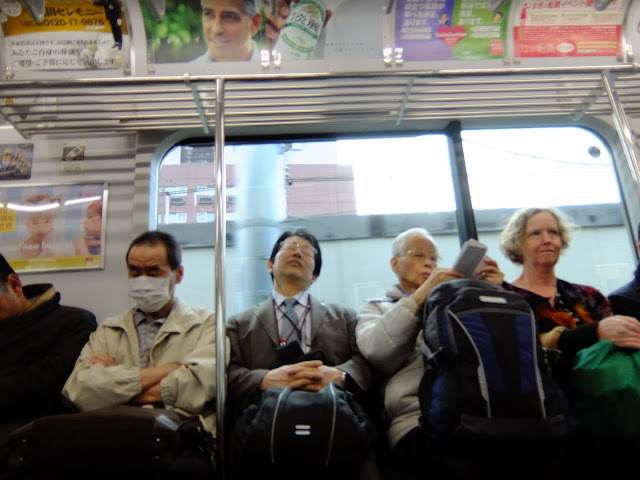 This is how the world looks at 6.25am Friday on the Yamanote Line. Social media not yet dominant.